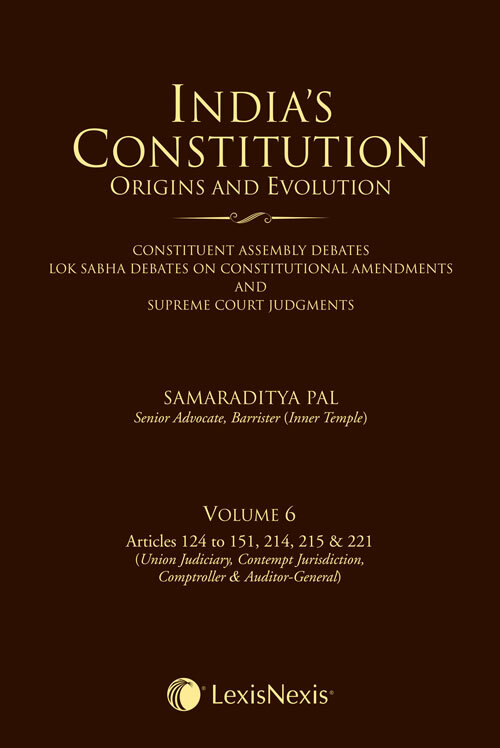 S Pal India’s Constitution – Origins and Evolution is a multi-volume series providing exhaustive article-wise analysis of the Constitution of India. Volume 6 of the series covers Articles 124 to 151, 214, 215 & 221 on the Union Judiciary, Contempt Jurisdiction and Comptroller and Auditor-General of India. The overview on each Article comprises of author’s expert comments on the evolution of the constitutional provision in a nutshell. It consists of the extracts of the Constituent Assembly Debates, significant Supreme Court decisions and Parliamentary Debates on the Amending Acts. The introduction briefly explains the genesis & evolution of the Constitution and Reading the Book describes the unique treatment and arrangement in the series. The book is indispensable for Law practitioners; Judges – Supreme Court, High Courts & Trial Courts; Law Firms; National & State Judicial Academies; Court and Parliament Libraries; and Academicians & Research Scholars.